Among the San Diego beers, there is one thing that I look forward to twice every year. That is the Yulesmith from Alesmith, a specialty brew that is released each Summer and Winter. Each year it is fantastic and this year’s is no exception. Unlike most specialty Summer ales, which tend to be on the lighter side, the Summer Yulesmith is a hopped up Double IPA at a nice solid 8.5%. This would go well with the new recipe of Hop Head Red and West Coast IPA from Green Flash. This beer pours a nice middle color on the IPA scale, similar to a light amber. It has plenty of light citrus flavor and pine balanced out by enough malts that it doesn’t get too in-your-face. I might have liked more hops in this beer but I also appreciate attempts to balance out a beer. From the bitterness I tasted this is probably somewhere around 85 IBU, so it is a good middle ground for those hooked on the bitter brews. 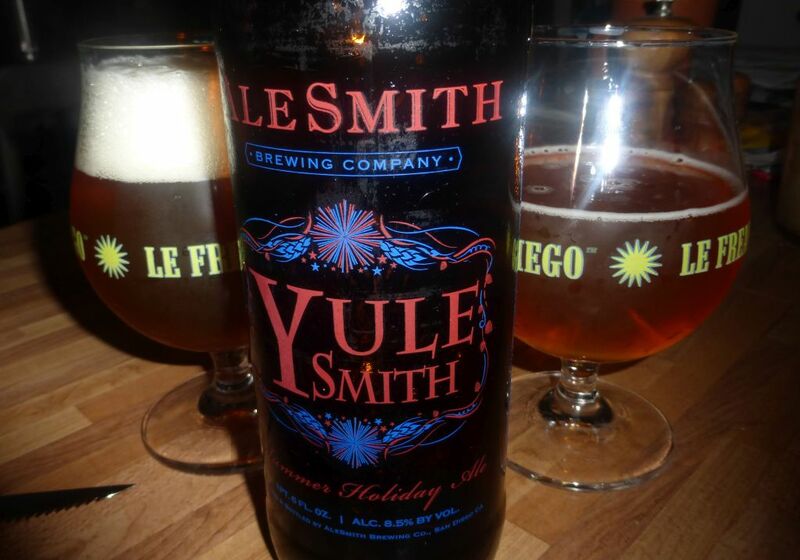 Summer Yulesmith is available in 22oz bottles at most of the stores where you see Alesmith beers and at the tasting room. This is the perfect beer to use to bring your hop head friends along to the Alesmith tasting room if they haven’t been there yet.